Kulyk, Ivan [Кулик, Іван], b 26 January 1897 in Shpola, Kyiv gubernia, d 10 October 1937 in Kyiv. Soviet Ukrainian writer and political figure of Jewish origin; the husband of Liutsiana Piontek. In 1914 he joined the Bolshevik party and emigrated to Pennsylvania, where he was active in the Russian and Ukrainian socialist movements. He returned to Ukraine in June 1917 and became a member of the first Soviet government in Ukraine in Kharkiv in 1918. In 1919, as a member of the Collegium of the People's Commissariat of Foreign Affairs, he was engaged in underground work in Western Ukraine. In 1920 he was a member of the Galician Revolutionary Committee. 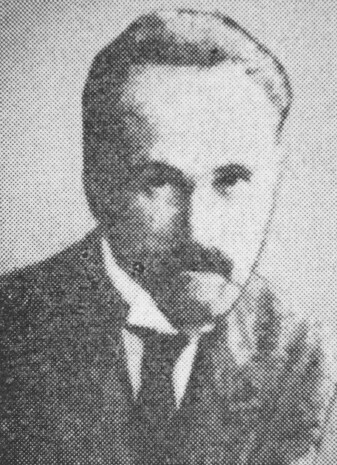 A member of the proletarian writers’ group Hart from 1923, in 1924–7 he was a Soviet consul in Montreal. In 1927 he became a founding member of the All-Ukrainian Association of Proletarian Writers and edited its journal Hart. From 1932 he headed the organizing committee of the Writers' Union of Ukraine; in 1934 he became the head of the new union but was removed in 1935. In 1936–7 he directed the Radio Committee of Ukraine, and in 1937 he was elected to the Central Committee of the CP(B)U and the All-Ukrainian Central Executive Committee. Despite his loyal service to the Party and denunciation of numerous ‘nationalist’ writers, however, he too was arrested by the NKVD and was executed during the Yezhov terror of 1937. Kulyk began publishing poetry and political articles in the Ukrainian socialist periodicals Robitnyk (Cleveland) and Robochyi narod (Winnipeg) under the pseudonym R. Rolinato before the Revolution of 1917. Between 1920 and 1935 he published in Ukraine eight collections of poetry, several long poems (including a collection of six of them in 1930), and several collections of short stories, most notably Zapysky konsula (Notes of a Consul, 2 vols, 1934). His political articles appeared in the Soviet press and in the Winnipeg paper Ukraïns’ki robitnychi visti. He also wrote several articles about the history of the CP(B)U and the revolutionary period in Ukraine and translated a large anthology of 33 American poets into Ukrainian (1928). He was posthumously ‘rehabilitated’ after Joseph Stalin’s death, and books of his selected works (1958, 1962, 1967) and a volume of memoirs about him (1971) were published in Kyiv.